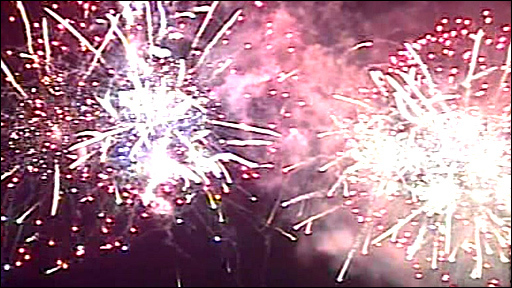 Liverpool's year as European Capital of Culture finished as it began with a massive firework display to mark the end of its reign. The historic waterfront was lit up for the People's Celebration, which saw city officials hand over the Capital of Culture mantle to Linz, Austria. A crowd of 30,000 gathered on the banks of the River Mersey to watch. Creative director of the city's Capital of Culture Phil Redmond said they had "changed perceptions of the city." The year was launched with a ceremony which saw former Beatle Ringo Starr singing from a platform on top of St George's Hall. 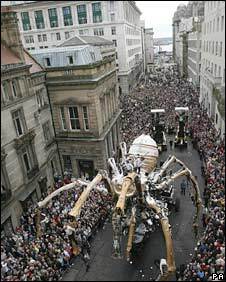 Other highlights included the Turner Prize, MTV Europe Music Awards and La Princesse, a 50ft (15m) high mechanical spider that crawled through the city centre. A film showing different events from 2008 was played on screens near the Liver Buildings. The film featured a musical medley of Liverpool bands, words from the poet Roger McGough and ended with the words "to be continued". A total of 7,000 events featuring more than 10,000 artists have been staged across Merseyside as part of the year of culture. Millions of pounds have been poured into the city and although some plans never made it off the paper, other buildings will have a lasting impact on the city's landscape. They include the £1bn shopping centre, Liverpool One, and the £800m generated from a five-year investment of £125m, plus income generated from 3.5 million first-time visitors to the city in 2008. But Phil Redmond said this was only part of its success. "The most important fact is we've got every child in Liverpool involved in Capital of Culture. "I think what we've done this year is change the perception within the city of itself. "The goal is to keep bigging ourselves up." Liverpool City council leader Warren Bradley, said: "We set out to change the perception of the city outside of the city. "People who thought Liverpool was a downtrodden, godforsaken place have seen Liverpool in a completely different light and Liverpool people are walking around 50ft tall." Spectator Peter Jones, 73, from Chester, said: "We've come to a lot of the arts events. It's wonderful what it has done to lift the whole community." Phil Gregg, 31, a street performer from Barrow-in-Furness, Cumbria, said: "It's going to leave so much behind, so many buildings and so many shops." Away from the riverside celebrations, museums, galleries and music venues kept their doors open late at night to allow people free access. Earlier this week Prime Minister Gordon Brown visited and was given a tour of Liverpool's regenerated docks area by Phil Redmond. He hailed the city's tourist success over the past year , saying it was an example to the rest of the UK. "I think the whole country has looked to Liverpool and learnt from Liverpool," he said. The government wants to build on the success with a competition for a British city of culture to be held every four years. Did the right city triumph?